Pudsey Bear paid a visit to the café on Friday 17 November for Children in Need and everyone contributed to this very good cause! Ruth Gillan returned to the café for four weeks between October and November. She based her reminiscence activity on a project being run by Ipswich Museum – In My Life/You Are Here. 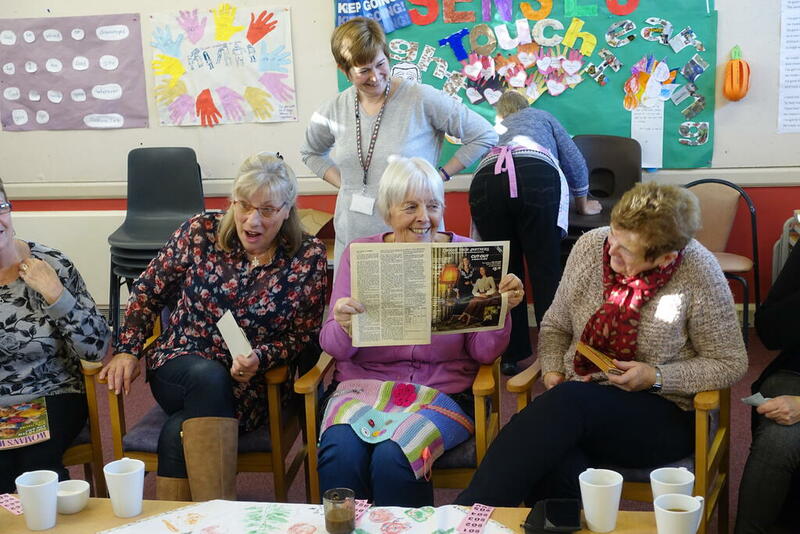 Over four weeks customers made scrapbooks of places where they worked, what they did for entertainment eg visiting the cinema and bingo, seeing The Beatles perform and where they shopped. Customers were stimulated by objects that brought back memories and also brought in objects that meant something to them. As always, these sessions caused much laughter and enjoyment! Each week the café provides a 2 course lunch cooked on the premises. We provide alternative options for diabetics, those who are gluten-free and Vegetarians/Vegans. Since October the café has been holding a weekly raffle. This is helping to raise funds to pay for activities where a charge is made. This Autumn these activities included: An Accordion Band, a Ukelele Band, and visit from a print artist where customers made Christmas cards and wrapping paper. There are always lots of prizes donated by customers and volunteers. Coming up in the new year…..we are planning on having some physical activities eg sitting Boccia, Kurling and once a month running a sporting memory session.